Make sure Manual is selected as the Evaluation Process Type. Specify the unit for which this evaluation process is being created. In the Title field, type a name for the evaluation process. Type a description of the evaluation process, if you choose. Click Save. The new evaluation process has been added. 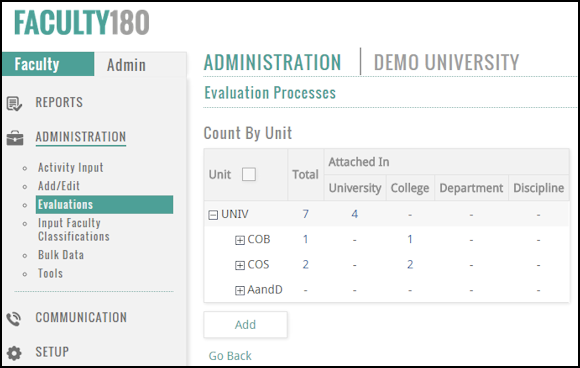 Select the unit associated with the evaluation process you wish to view. 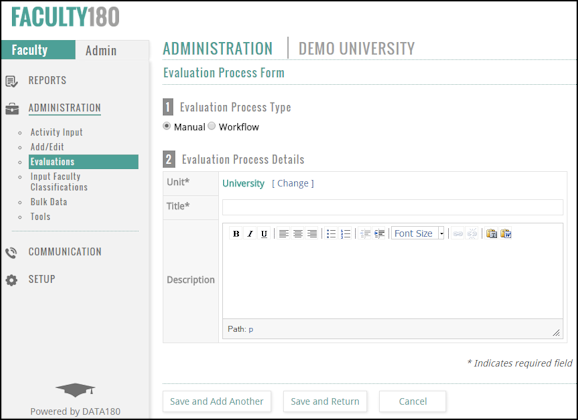 The Evaluation Processes screen displays, showing a list of existing evaluation processes and their associated evaluations. Click the View link adjacent to the desired status.The Status of Evaluations screen displays. If necessary, use the various filter options to specify the type of evaluation processes to view. Click the corresponding Completed link for an evaluation process to view which evaluations have / have not been submitted by evaluators and authors. Evaluations that have already been submitted can also be viewed. Click the unit associated with the evaluation process you wish to edit. The Evaluation Processes screen displays, showing a list of existing evaluation processes and their associated evaluations. Click the Edit icon adjacent to the evaluation process you wish to change.